We are studying the predator-prey dynamics of wolves and threatened woodland caribou populations across a broad landscape of variable anthropogenic disturbance. We plan to elucidate the links between human activities, wolf predation, and caribou conservation in such a way to better guide conservation and management in the Canadian Rockies. 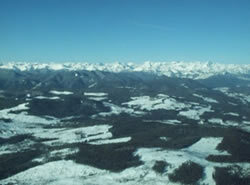 Forestry and fire convert old-growth forests to younger forests, which are typically low in arboreal lichens and are poor quality caribou habitat. However, regenerating forests can provide high quality forage for other ungulate species such as moose and elk, allowing these species to thrive. Do increased primary prey (moose and elk) populations serve to increase wolf populations and indirectly generate higher levels of caribou predation by wolves? 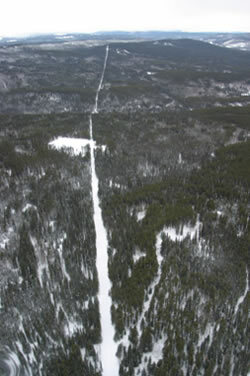 Oil and gas exploration involves extensive cutting of linear openings, or seismic lines, through forested landscapes. Do these seismic lines increase predation efficiency of wolves on caribou, and thus lead to increased caribou mortality? We are studying wolf and caribou populations in the Canadian Rockies, across a wide gradient of human resource exploitation. We are currently using GPS technology to intensively monitor the movements and ecology of 7 caribou populations and 11 packs of wolves throughout the study area. We have an existing data set of caribou and wolf locations that we will augment with ongoing capture efforts during fall 2007 and winter 2008. We are also currently developing methods to assess other prey (moose and elk) densities relative to human activities, and collecting data to develop models of season- and species-specific kill rates of wolves across the range of caribou populations. Predictive, habitat-based models of seasonal abundance, resource selection, and community dynamics of wolves and their prey across a gradient of human resource development will provide us tools and insight to shape future caribou conservation in the Canadian Rockies.